Bob Mackie refused to be bullied! Several years ago, in the fall of 2007, the landowners met and staged a demonstration in Georgetown to support Bob Mackie and his fight against the Niagara Escarpment Commission (NEC) who said that he couldn’t have an archery range on his ‘agricultural’ property. Unfortunately, his property, mostly rocks with a thin soil layer covering more rock was totally unable to support agriculture. The board members of the NEC showed little interest in his plight and despite overwhelming community and municipal support, voted to shut him down. 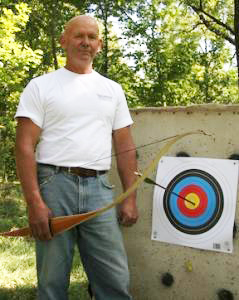 He didn’t give up the fight and continued to run his archery business, refusing to be bullied. Bob Mackie. We will miss you.